I’m not an experienced enough biscuit maker to be able to scoop out the right amounts of flour and shortening without measuring, but I can still make biscuits. Maybe not with the best of them, but well enough to receive compliments from my husband, which is really all I’m worried about. 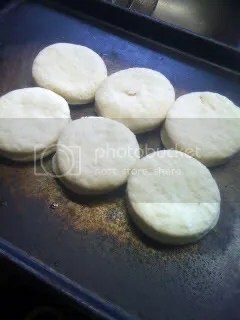 Biscuits at their simplest are essentially a quick bread, consisting of flour, a leavening agent (usually baking powder but sometimes yeast), a fat and liquid. 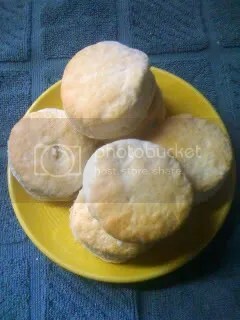 The simplest recipe that I know of is the one I use: Martha White “Hot Rize” Biscuits. 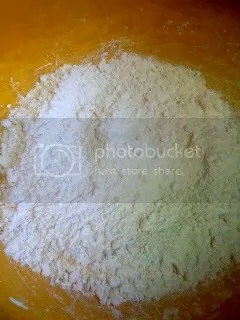 Self-rising flour, shortening and milk. Simple, easy and one of the few times I advocate using shortening (though if I had lard, I’d use it instead of Crisco in a heartbeat). I’m not going to give the recipe – the link provides that, and it’s commercial material – but more the method. Get your ingredients, preheat your oven to 450°F and come back when you’re done. Ready? Here we go! I use The Biscuit Bowl as my container, naturally, and a pastry blender to cut the Crisco into the flour. You can use a fork, two knives or your hands to do this; I just prefer a pastry blender. I find it best to work at a steady, even pace to cut in the fat – it will take a few minutes to get your fat properly settled into your flour, and if you aren’t sure you’ve done it right, then your biscuits won’t have that fluffy quality that most people are looking for. Even more than that, in my experience, rushing this step will keep your biscuit dough from coming together, making all your work a waste. By the end, my starter kit looks like the picture above: pea-sized pieces of floured shortening and smaller in a bed of faintly moistened flour. If you’ve gotten here, move on to the next step. Pour in your liquid – here, milk – and mix until the dough comes together. It doesn’t have to be perfect, just enough that the majority of the dough comes together cleanly. I use a fork to do this – a pastry blender is too fine-combed for this, and a spoon or spatula requires too much working. 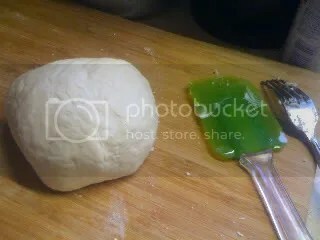 Note: If your dough is too wet now, add more flour bit by bit until your dough gets just dry enough to be worked with. Don’t overmix it! 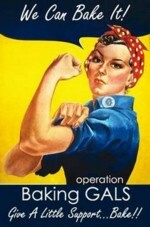 Biscuits are worse than muffins – if you overwork the dough, your biscuits will be tough in the end. Work with the dough only as much as you need to through each step. 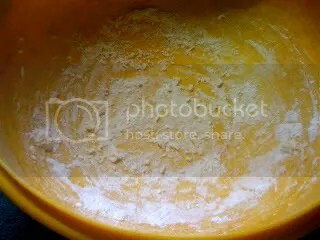 Once you get to this point, turn your dough out onto a lightly floured surface. Your dough should be slightly sticky but not super-sticky or very wet. Knead the dough lightly, just enough to make it smooth and elastic. I go ahead and form a ball, as if starting a boule, and let the dough rest just a few minutes while I clean up my area a little bit. After I let it rest, I get out my rolling pin and my preferred cutter – a white wine glass – and prepare my dough. I roll the dough out to anywhere between 1” and 1/2” thick, depending on how I feel. This morning, I wanted thicker biscuits, but I’ve made thinner biscuits for Cullen before. Once I’ve cut out my biscuits and put them on the pan, I’ll re-knead the dough and roll it out again to cut out more biscuits. I might do this one more time to make cut-outs, then take the remaining dough and make drop biscuits, just to prevent wasting the dough, as well as a tough biscuit from future cutting. 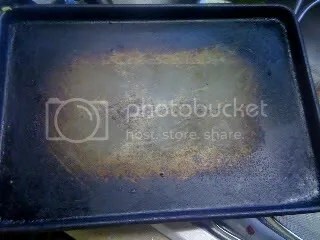 All biscuits in our house get baked on – you guessed it – The Biscuit Pan. 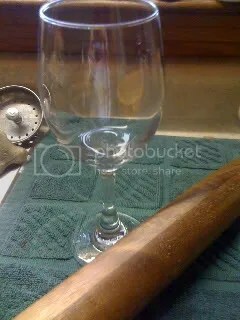 In its time of use, it’s acquired a cast-iron type aura, in that we do NOT, under any circumstances, wash it after use. It might get wiped off with a towel, but since biscuits are the only things that go on this pan, there shouldn’t be any need to wash it in the first place. Bake your biscuits on whatever you choose, remove them from the pan and enjoy them hot, with butter or jam or, as we did, some local honey. You can’t go wrong with a good homemade biscuit. How do you do your biscuits? Does your family have a special pan, or bowl, or something similar? What about your family biscuit “traditions”? This entry was posted in Cooking, Food and tagged Baking, Bread, Breakfast, Homemade by Kate. Bookmark the permalink. I’ve never made biscuits, but am now really intrigued because of the many different techniques that you’ve written about. I usually run the other way when any instructions tell me to “cut butter into flour using two knives”, ahah, but it is something that I want to do in the future. Those biscuits look yummy. No tradition in my family, but when my mom makes bread, she slams the dough into the bowl ;] It’s kinda scary. It seems scary, but really isn’t – the whole “two knives” thing never made sense to me, and imo takes way more time than any other method, but some folks use it. I’d recommend a fork, or your hands, instead. Sometimes it’s fun to be a kid in the kitchen and feel like you’re making a mess. :) Try the biscuits! You might be pleasantly surprised. BISCUITS, what a great tutorial. Now I am inspired. Send me luck! Thanks, Patti! Wishing you biscuit luck! Grandmoma would be proud dear and I do LOVE your biscuits!! !